A collection of documents and writings about the Jersey Act written during its duration. For a few weeks I had been considering posting something about the Jersey Act, and then just the other day I became engaged in a heated discussion on Facebook concerning among other things the Jersey Act, and I decided now was the time to post these few pieces. The industry narrative on this subject evidently has become that the Americans were dumping their horses on the English markets because there was a betting shut down, and the implication was our stock was inferior and England was being overrun with our less than stellar horses, and truly they had no choice but to impose the Jersey Act, to prevent the continual dumping of our stock on them, and the ruining of the breed. Before we even had a American Thoroughbred breed (1868), in 1856 a few American Running Horses were brought over to England to race. They did ok, and the English press reported they were surprising good but of course could not challenge the English bloodstock in quality. Several years later, after the American Thoroughbred had been established one of our breeders, Pierre Lorillard, brought a string of his horses over to race. One of the horses was the older gelding Parole, a good racer who at 6 years was now used by Lorillard as a exercise companion for his younger stock, such as the star Duke of Magenta. The English press enjoyed themselves by ridiculing Parole, calling him the Yankee Mule. Unfortunately Duke of Magenta became ill, and Parole was drafted to replace him in the Newmarket Stakes (1879), racing against the undefeated Isonomy, the pride of England. Parole won and that sent some shock waves through the aristocracy. But then a week later Parole won the City and Suburban Handicap against their top horses, and then the very next day he won the Great Metropolitan...the English industry was stunned, this was the exercise horse and he creamed them. Contrary to the modern narrative being pushed, the American stock was far better than the English, indeed, at many races if a American horse was entered the English horses pulled out because they knew they couldn't win. After Parole's success the American horses kept winning, taking virtually every important race in England and France, for example in 1881 Iroquois won the English Derby and Foxhall won a series of top races in both France and England. Not only that, the English sportsmen began buying the American horses and racing them in English colors and winning on them, and then breeding them and the offspring were winning as well. More American stables came over then because of the sport and the market for their stock. Then the betting crisis occurred, and many tracks in America went under, and so more stables relocated to England and France, resulting in several attempts to stop our stock from completely eclipsing the English industry, with progressively more severe restrictions imposed with strict pedigree demands. The English Jockey Club increased the required generations of General Stud Book registered stock to be entered from 5 generations to 8 hoping to eliminate the Americans from being eligible. When that didn't work the Jersey Act was legislated in 1913...demanding all generations be General Stud Book registered stock...which no American horse could meet as they all had American Running Horse lines. Not only that, all stock that carried American bloodlines was banned from the studbook as well, which meant that any other country that bought our breeding stock could no longer register their stock...the edict effectively banished the American Thoroughbred from the international market. Now, the current excuse I was given for this punitive act was that the English had to do it...really had no choice, to protect the integrity of their breed, by preventing the American's dumping inferior stock into the English market. But that narrative has no substance when you investiage, no, the real reason was the English were losing control of their industry because they American stock was better than theirs, beating them at their own game and they were not going to tolerate it. The real idea was to destroy the American Thoroughbred, the only population that could challenge their supremacy. This edict was in place for 36 years, from 1913 to 1949, and only ended when the English industry was so hurting that they had no choice. But don't take my word, instead review these 3 pieces from when the act was in place, written by the people who were living it. Let me just say this, the English created the Thoroughbred racehorse, and by selective breeding produced a wonderful breed. The American Thoroughbred was able to best them not because we are better breeders, but because we had more of the speed, stamina, sturdiness that came from the original Hobby-Running Horse, breeds that were eradicated by the English. Both the English and the American Thoroughbred arose from the same mare base, as the modern DNA studies are discovering. The difference is we in the colonies and then States did not wipe out the source, indeed, we made most of our native horse breeds from the stellar traits that base stock provided, including our 3 racehorse horse breeds: American Thoroughbred, Quarter Horse and Standardbred. Another factor, is the American industry kept the 4-mile heat racing performance test in place for 200 hundred years, and only changed it when it adopted the English Classic test in 1868, therefore the English were facing horses that could run 4-mile heats day in and day out and their offspring, a level of performance that has not been equaled since that day. 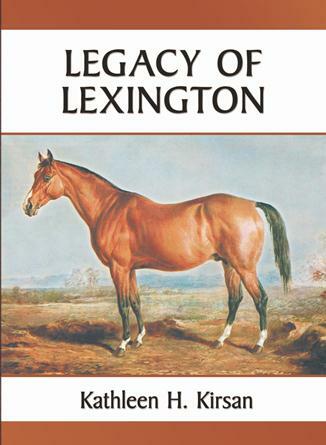 Read the full story of the development of the unique American Thoroughbred including its experience overseas, the Jersey Act, and the unexpected outcome, resulting in our stock once again winning the world's races when the Irish began raiding our sales in the 1960s-1980s, in Legacy of Lexington.